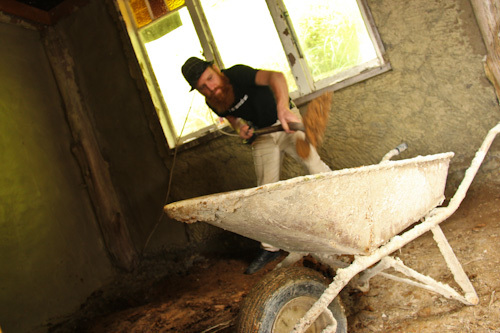 As we travel, we meet amazing people who are building their own homes. We get to see houses in all stages of completion and all sorts of alternative building styles. 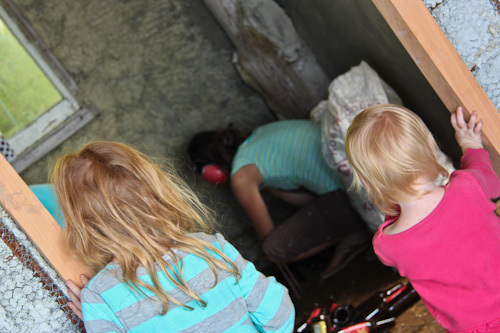 This month, we were introduced to the idea of glass bottles being used as an insulation under the concrete floor. 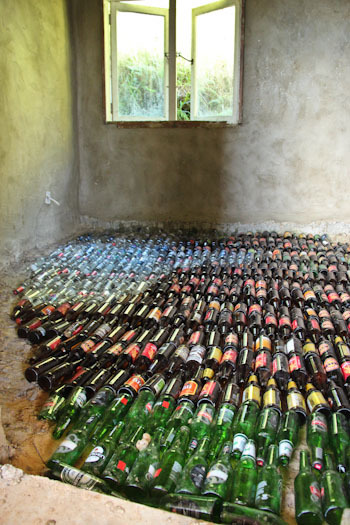 Because the glass bottles hold a layer of air between the dirt and the concrete floor, it acts as a blanket under the floor, keeping the house temperature more stable. At Pat and Mandy’s, we got to see a glass-bottle floor under construction. The bedroom floor first needs to be excavated about six inches. David and Pat dig up the packed dirt the old-fashioned way. 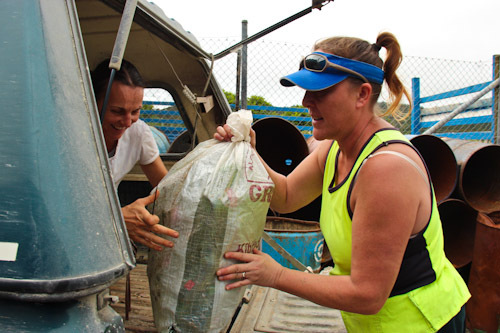 While the men are digging at the floor, Mandy and I head to the local dump station to collect some glass bottles. 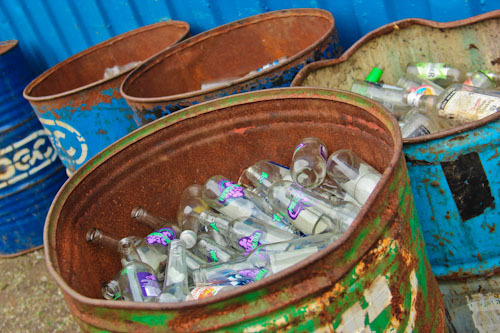 We pay $4 for approximately 1000 bottles, but no one is counting. 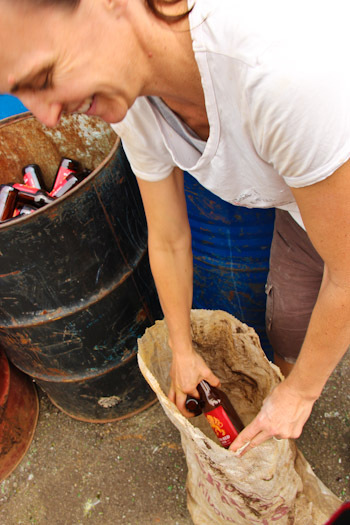 Mandy and I pull the glass bottles out of the barrels and put them into large sacks. The bottles are waiting for us — neatly sorted according to colour. Tip-worker Faye helps us lift the heavy bags into the back of the vehicle. 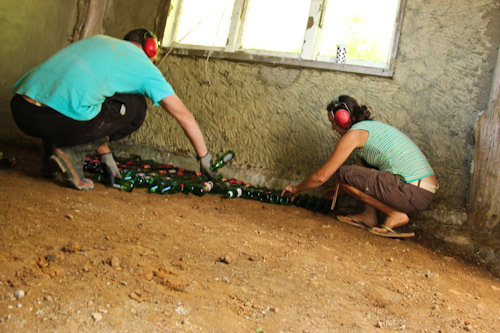 Once we get back to site with the glass bottles, Pat and Mandy begin laying them down on a bed of sand. Ear-muffs are necessary because the glass bottles are so noisy as they knock each other into place. We're pleased that our girls get to see this phase of house construction. 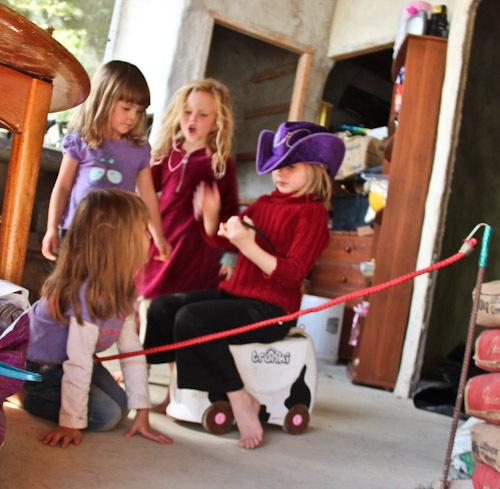 But most of the time, our girls are engaged in imaginative games with Shasa and Tierra. The bottles are arranged in neat rows of alternating directions. Laid on a base of sand, the bottles are strong enough to walk on. 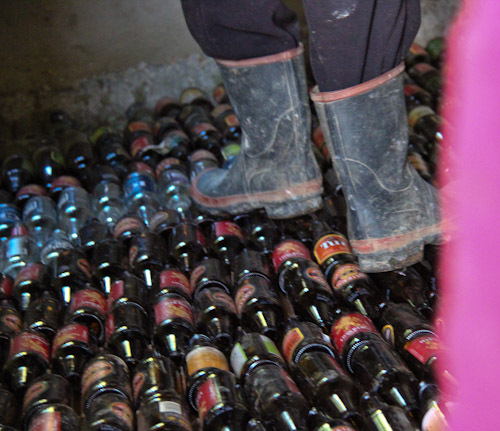 Another layer of sand is spread over the bottles. A layer of plastic sheeting is next. 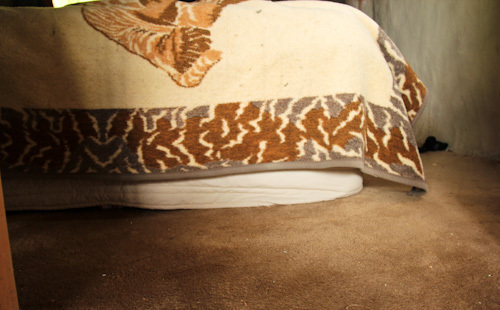 It prevents moisture from rising from the ground to the floor. 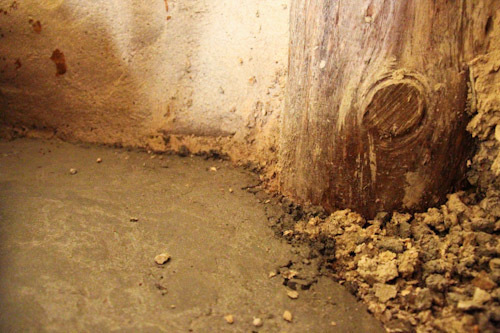 Once the concrete is poured over the top of the plastic, it seems like an ordinary floor — only it has amazing insulation. Once the carpet is laid over the top of the concrete, no one thinks about the sub-floor any more, and only these photos are the proof that we're walking on glass! Pat and Mandy’s two daughters are fortunate in being able to watch their house being constructed from start to finish. Surely this is a fantastic education in itself, and I’m glad our own children have been able to witness some of the construction states as well! 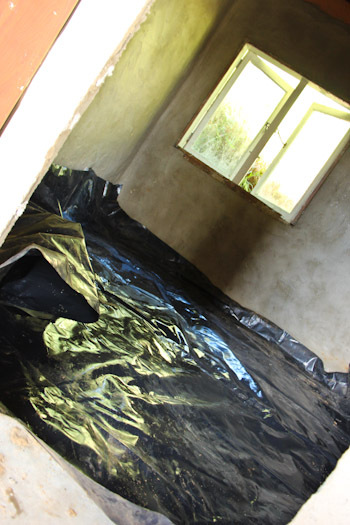 I don’t think we’ll ever build a house from scratch, but when we meet people who are keen to use alternative building methods, we’ll be certain to recommend a glass-bottle floor insulation! Thanks, Pat and Mandy, for letting us share this experience with you! That is totally facinating … filing away the information for later as our bus doesn’t need that type of insulation. This is so cool. I’m glad you blogged about this. Cool idea! Glad you survived the previous posts drama with no real problems. It is very interesting to know that the glass bottles are strong enough to withstand concrete being placed around them. 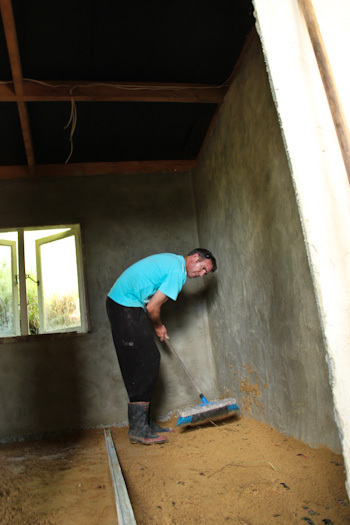 The reused glass bottles create an air pocket in the concrete which helps keep the concrete floor insulated against the underlying cold sub base and is surprisingly strong in structure. Very interesting. What an innovative idea! It is very interesting to know that the reused glass bottles create an air pocket in the concrete which helps keep the concrete floor insulated against the underlying cold sub base and is surprisingly strong in structure. It also cuts down on the amount of concrete you need to use. Very interesting.